This project is a prototype! More features are to come! 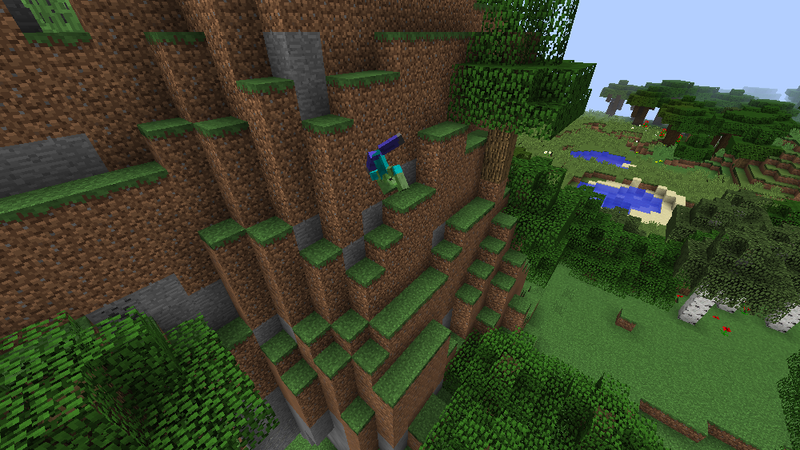 This mod adds ragdoll physics to the Minecraft World. Seeing the name you probably already know when you can see these physics (─‿‿─). The standard death animation has been replaced with a ragdoll corpse that interacts with the enviorment, other entities and you :P.
Feel free to make a video about it, and spread the word! Sorry for all the troubles and bugs that made you not see the features :_(. I am fixing it right now! The bug has been fixed! Feel free to create a mod showcase :). This sounds like an amazing idea! If you could make it a .zip file it would be much appreciated! I was brought here by DanTDM. I need it to be .zip because for some reason whenever I try to open a .jar file it won't open at all man! So if that is possible it would be much appreciated! #1 Baby and villager zombies seem to turn into regular zombies. Is there going to be compatability for this or was this intentional? But, it is still fun just to kill zombies and watch them flop off a mountain side. Hmm, that is odd xD. I know what the problem is though, gonna be fixed! :P.
Yes, 1.7.10 is coming out, maybe even today :P.
Also, do you have any suggestions about how one simply would remove the ragdoll corpses? I don't want an item, because then it wouldn't work on servers. Also, new KeyBinds are overrrated xD. Well, your reaaaaal looking forward to it worked xD. The 1.7.10 version is out right now! It may take some time for the widget to display it here, but you can still download it from my website, gobbob.net :). And yes, this mod was first supposed to be a part of Mo' Bends, but I decided it should be a standalone mod that is direcly compatible with Mo' Bends :). When I add more ragdolls here and add more mechanics, I am gonna make an opportunity for people to make their own ragdolls for their mods :P. What do you think about this idea? I got this crash saving and exiting after testing this mod with some of the guns from flan's mod. Other then this bug this mod is amazing and very fun to mess around with. Especially watching zombies, skeletons and creepers drop like a sack of potatoes after being shot. The amount off time the ragdoll remains in the world might be what causes the crash but this is just a guess. You should have the body fade away after remaining still for 5 secs or 10 secs just like the Ichun dismemberment mod to avoid causing lag or causing the crash. Also a few small suggestions after you iron out the bugs, could you make the rag dolls fly if they die from a explosive round or explosion itself. I'd say the only improvements there could be would be for the mobs to have better collision boxes (Their limbs go through each other a lot and they fall into the ground quite often), and more mobs. Also, a feature for dragging them around in some way would be cool. And, of course, any other awesome ragdoll tools that could be used for fun. Very cool mod, looking forward to testing it with some others to make sure it runs conflict free. Agree with Eternal_Man for adding support for other mods if possible or perhaps and API of some kind although obviously dynamic support is the preferential if possible. Also some kind of whitelist or blacklist either in config or in menu would be extremely desireable so players and server owners can fine tune things to their exact liking. Thanks for the hard work man, this is a fascinating new mod! Sure :). The thing is, I would have to make a ragdoll corpse model for every mob from scratch, and that would be problematic, since I don't have the model code. That is why I am going to make an oportunity for other modders to make Ragdoll Corpses for their mod mobs :P.